Sensei Sherry is one of the most senior British practitioners of karate and the chief instructor of the Karate Union of Great Britain. His interest in karate began in the 1950’s and led to him founding, with others, Liverpool’s first karate club. He studied with Senseis Murakami and Mochizuki in the early ’60s and from 1965 with Senseis Kanazawa and Enoeda. In 1966 he became the first person in Great Britain to be awarded a black belt in Shotokan karate. That same year he won the first British all-styles championship, beating competitors from all of Britain’s karate styles. 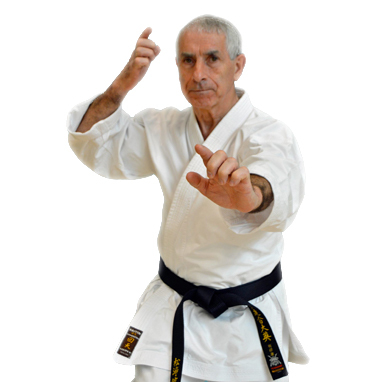 In 1968 he became European champion in kumite, going on to dominate the early KUGB karate championships, winning the kata competition for the first four years running (1967–1970). He has had many other firsts in his long karate career – the first 3rd Dan, the first qualified British Shotokan International Referee, and he now holds the rank of 9th Dan. He continues to teach at the Red Triangle Karate Club in Liverpool.